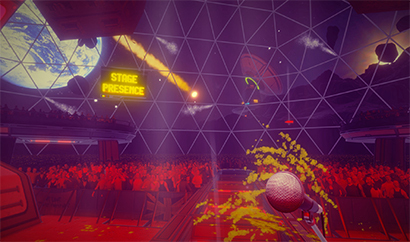 Developed by Sea Green Games and tinyBuild, Stage Presence is a karaoke simulation video game, available on the Windows, Oculus Rift, HTC Vive, and OSVR operating systems. Additionally, a mic is required for this karaoke-style game. 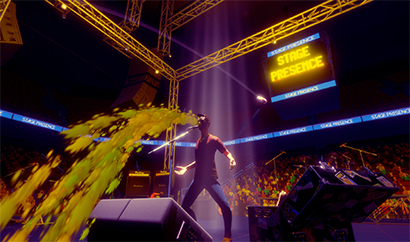 Play as the lead singer of a band that has some truly wild gigs. Due to equipment that's always failing, players soothe different crowds using only their voices. Expect a wild ride as the crowd gets more and more unruly. Stay focused when they start booing or get heckled even more. There is a campaign mode that follows players' rise to the top. Players sing their favorite tunes as the venues get crazier and the crowd gets weirder. Forget goths and instead get ready to rock out for some demons! Additionally, a multiplayer is available. 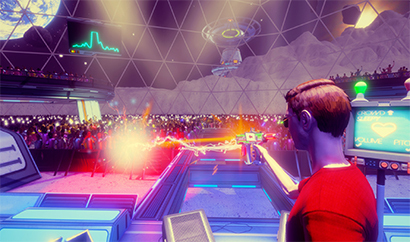 Join the unruly crowd and be someone's key to victory or their ultimate downfall. 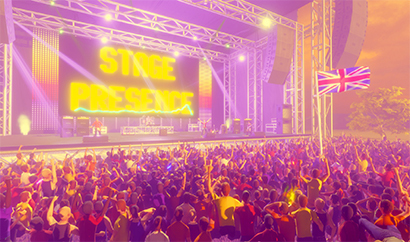 Stage Presence uses a mic and allows users freedom when entertaining their crowds. Rap, sing, or even hum as long as the monitor shows that they're happy. It won't be easy maintaining focus, though. As the crowd gets more aggravated, expect the heckling to get worse. Booing is nothing compared to flying bottles of pee! Rowdy groupies flash lasers and sometimes even turn into demons. Unlock different skills like smashable guitars and projectile vomit. These abilities help players keep the crowd from getting too mad. 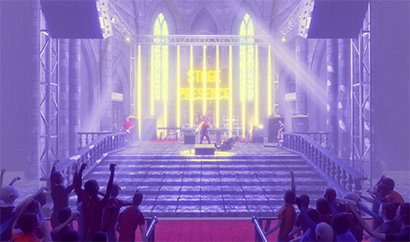 Play through the campaign and experience lots of different venues. From haunted cathedrals to rocking out on the moon, users find themselves trying to keep crowds happy all over the solar system! Additionally, there's a multiplayer system built into the video game. Join other players' games and pick whether to help or hurt them. Become the crowd in this mode, and heckle like the best of them. Alternatively, players cheer their friends and others to victory and help them complete tough levels. There are other modes as well, such as survival and traditional karaoke with lyric support. Enjoy this video game in full virtual reality, as well. It features fully integrated support. With many different ways to play, it's easy to hook up the mic and jump right in! 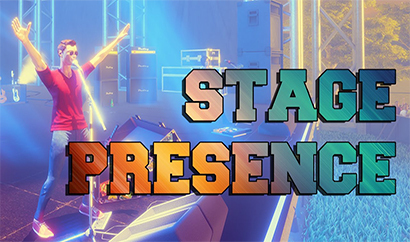 Stage Presence is a comedy karaoke video game. 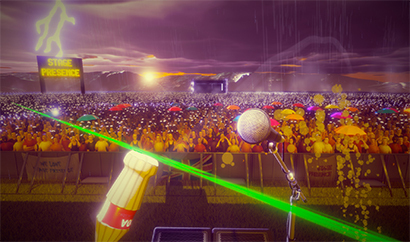 Play as the lead singer of the unluckiest band ever, and have equipment constantly break. Keep crowds entertained using any number of methods like singing, rapping, or even attempting jokes. Unlock skills that help keep the crowds satisfied until the equipment is fixed. Jump into other players' games and become their worst nightmare or their saving grace. 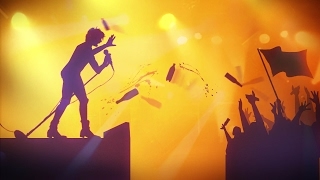 This unique simulator video game offers a twist on the classic experience of karaoke, and has something for users of every musical talent! Stage Presence puts you at center stage in front of a huge crowd. Regardless of equipment fails, do whatever it takes to keep the crowd entertained! © 2018, Sea Green Games. Sea Green Games logo, Stage Presence, the Stage Presence logo, are trademarks or registered trademarks of Sea Green Games. in the United States of America and elsewhere. All rights reserved.